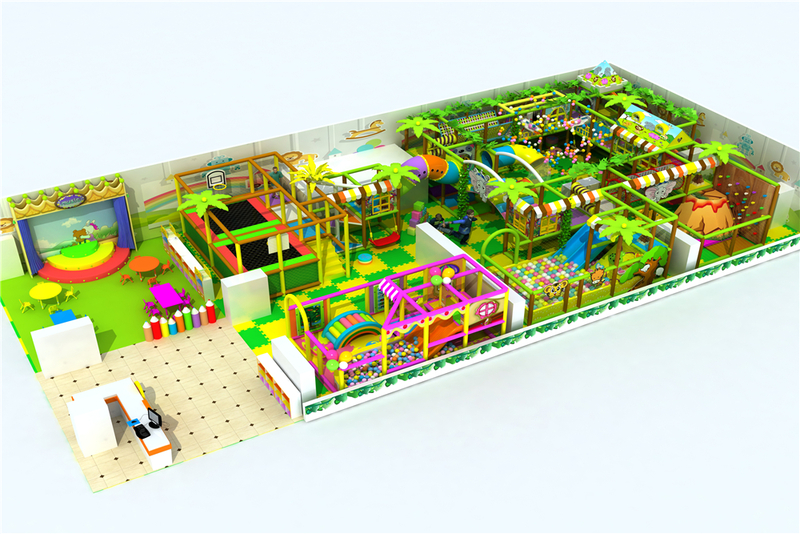 This playground sets four different area, the main play sets have climbing wall on corner and one ball plastic area, one ball pit and trampoline, also some small toys and obstacle game. then near the reception room have football game and toddler play house. opposite to the dodor is rest area for parents and birthday part. Design for Engineering & Consulting Incorporated Co.
Children's mood is the biggest concern for every parent. They always worry about their children whether grow up happily. So in their childhood, the parent are more care about the children's mood.They want their children have a good childhood. Choose a good play equipment for them could be a solution. All children like play at swing. So the parents always face a problem is that how to choose a correct swing for children. Are you looking for a swing set with ability of installing it inside your home, perhaps inside your kids playing room? Indoor swing set for kids is a great idea because swing is fun, convenient and very easy to set up. Whether you own the house or have just got it on rent, you can safely use these sets. They simply fit between the floor and ceiling of your house or apartment and cause no damage to the walls, floor or ceiling. If you check out the Pegasus model, you will see that the swing is in the center which not only provides balance and equilibrium to the whole structure but also gives additional security to your kid while he is swinging. Kids have a lot of energy that they need to burn off. Indoor swing sets provide them a way to do that. As a parent, safety of the kids comes first. We realize that that's why we incorporate the best possible safety precautions in our products. However, there are lots of things you can do as a parent to make the experience better. Get involved! Make up a silly contest like who can swing the fastest or the highest or even who can swing the longest. Kids love playing games and they love it even more when they think it is a contest. Think of how motivate your kids when you invited over the neighbors for a little competition? This will not only spice up your kids' motivation but will also help in doing some fun exercise without thinking of it as a burden. So buy a swing to your home and surprise your child or children with an indoor swing set. They are a great gift to give for a birthday or Christmas when it is too cold to be on a swing set outside. The best part about having the indoor swing set is you don't have to constantly be outdoors with your children or always running to a window to check up on them. Parents can sit back and relax or even clean the house while the kids are safely right by playing on their very own indoor swing set.